This was such a fabulous day! Steve Spangler was beyond anything we could’ve ever imagined! If only all workshops ran this way! I can’t begin to put into words how awesome today was! I’m so thankful that Steve Spangler was able to come to North Elementary to make all of us excited about teaching science again! The Hands-on Science Boot Camp Registration is coming soon! If you would like to be notified on future Steve Spangler Science events, please submit your details to the right and we promise to be in touch. Can’t wait to come to a Boot Camp? You don’t have to! With our Virtual Science Workshop the workshop comes to you. See more details and register today for our online course by visiting our Virtual Science Workshop under the Teacher Training section. Fill out the inquiry form if you are interested in being notified on any upcoming workshop opportunities. 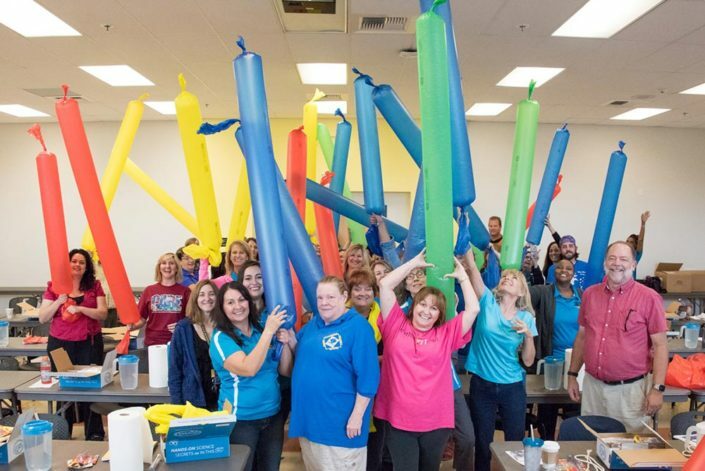 Steve Spangler has personally trained over 20,000 teachers with his one-day boot camp program. 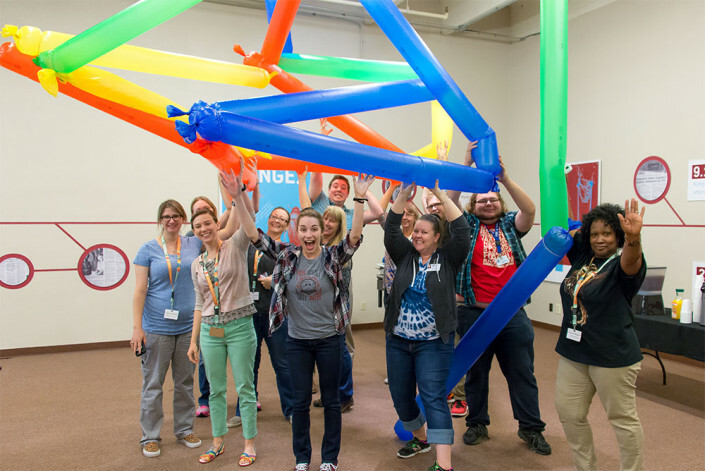 It’s the perfect kick-off to the school year or a great way to re-energize the troops as they focus on making science more fun and meaningful. Does hands-on science = hands-on learning? Yes… but only when you learn how to make the connection between educational concepts, hands-on experiences, and real-world applications. Steve Spangler’s classroom-tested strategies and top-notch presentation techniques are guaranteed to change the way you think about integrating science into your entire curriculum. 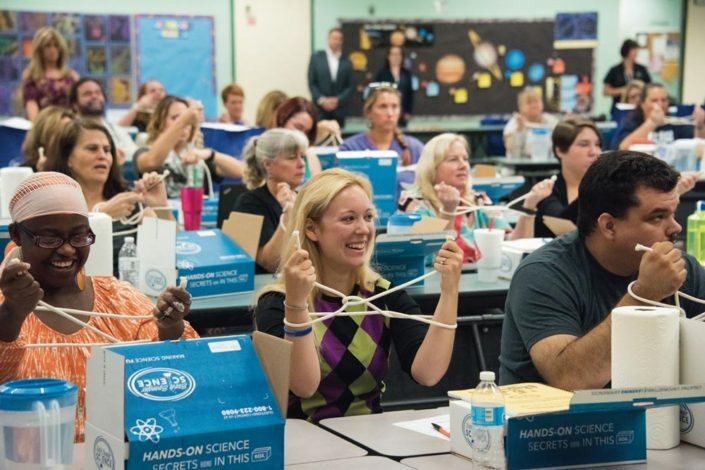 This fast-moving seminar is for early childhood, elementary and even middle school teachers who need creative science integration strategies… who are tired of trying to “squeeze” science into their already packed teaching schedule… and who want to make science even more fun and meaningful in their classroom. Stop squeezing and start integrating! What makes this training experience different? 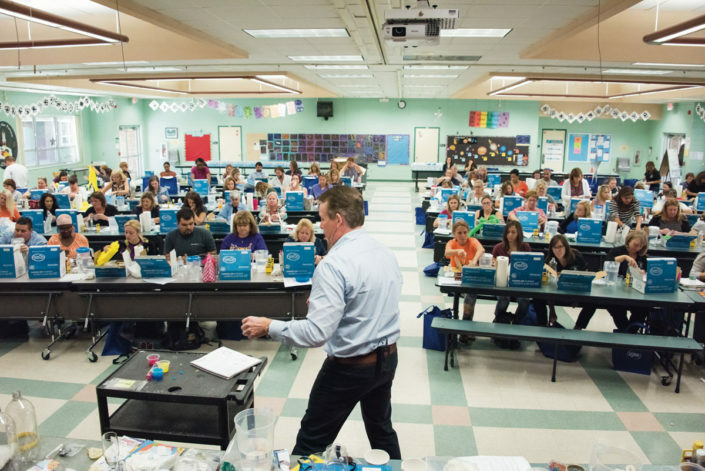 Steve uses a successful model of motivating and teaching with captivating demonstrations and eye-catching learning tools while remaining focused on the real science that is being taught. The learning objectives are clear and concise – Explore new strategies to increase student engagement, focus on teaching real science and never forget the importance of evaluation. 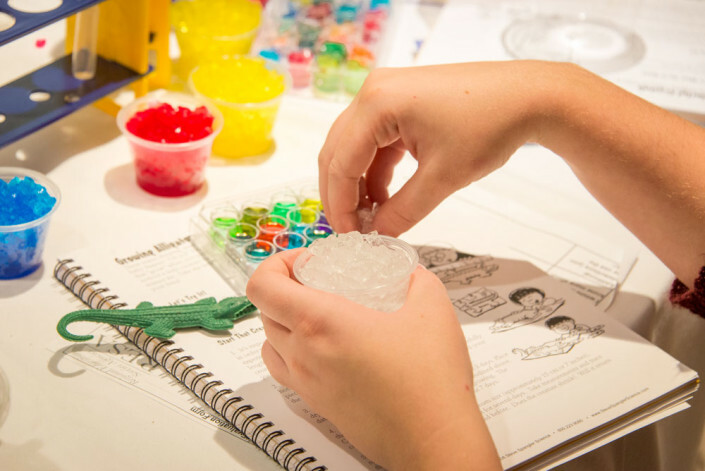 You’ll learn how to develop a variety of science demonstrations, experiments, and thought-provoking ideas that promote exploration and strengthen critical thinking skills. The inquiry in each exercise prompts students to think more like scientists and to solve challenging problems using the scientific method. Best of all, you’ll leave this experience with the knowledge, presentation skills, strategies, tools and commitment to make science an integral part of your teaching day. Use hands-on engagement to reinforce fundamental scientific principles that are commonly taught at the elementary and middle school level. Take away the knowledge, preparation, tools, and confidence to become the best science teacher possible. In just one day, you’ll be well on your way to using Steve’s strategies for creating unforgettable learning experiences for your students. MORE THAN JUST CUTE IDEAS… WE NEED SOLUTIONS! 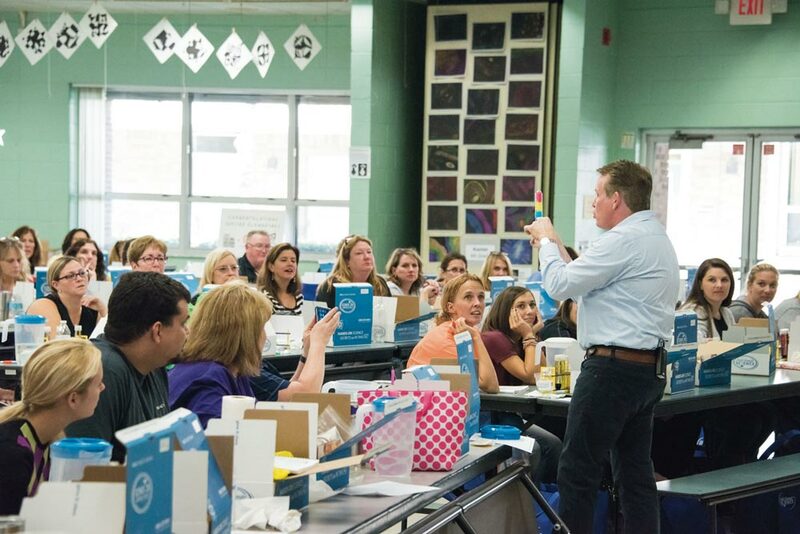 Bottom line… Steve Spangler will help you take the fear out of teaching science and become a more effective science teacher using simple and inexpensive materials… guaranteed! You will receive a “Survival Kit” filled with gizmos, gadgets, and learning tools that will allow you to practice dozens of amazing and simple science activities with Steve during the workshop. The “Survival Kit” is yours to take home, along with a 65-page activity guide, to help you implement creative science teaching to get your students excited about science. 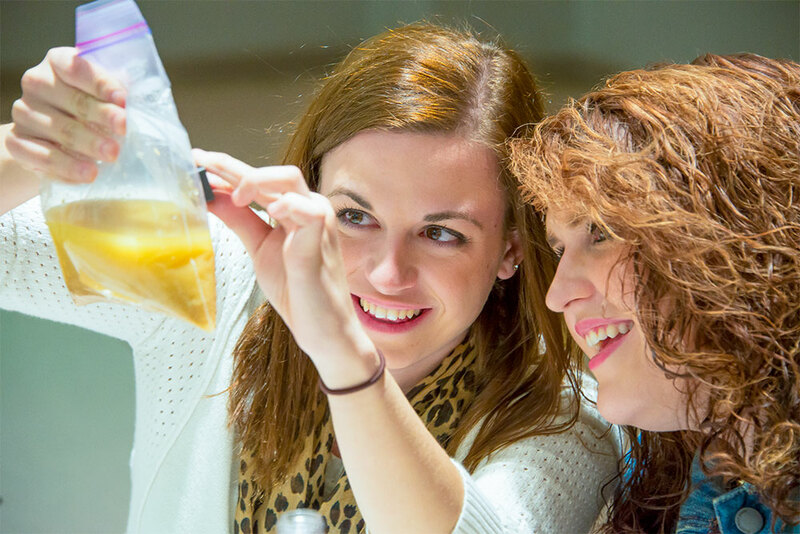 This seminar is designed to meet the practical needs of busy elementary school teachers who want to make science more exciting, stimulating and meaningful. The curriculum covers themes such as air, color, light, magnets, weather, states of matter, chemistry, force and motion and Steve’s ooey, gooey supermarket science. 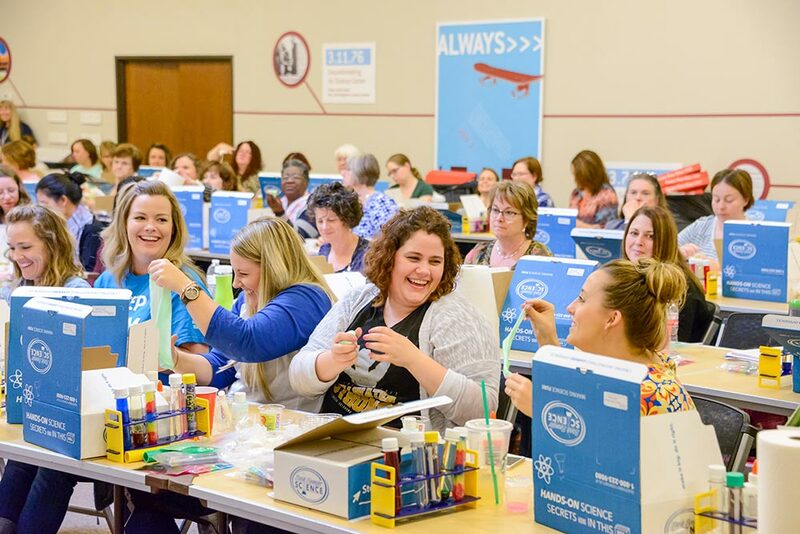 You’ll participate in more than 30 eye-catching demonstrations and hands-on activities that help children pursue the why-factor of wonder, discovery, and exploration. Explore a number of great science ideas that encourage children to “play with a purpose.” By the end of the day, your head will be filled with creative ideas that you can put to use immediately. You’ll leave this seminar with the knowledge, presentation skills, and tools to make science the favorite part of your teaching day. Throughout the seminar, Steve focuses on a variety of techniques and presentation ideas for connecting science with popular children’s literature. Use today’s popular children’s literature to introduce scientific concepts. Is the book fact or fiction? Create developmentally appropriate activities to test the students’ theories. Use elements of the story line to teach and reinforce fundamental parts of your early childhood science curriculum. Use children’s literature to help them build connections between science concepts and their day to day experiences. Gain a better understanding of the “Failure Model” and how it can be used to boost the creativity of your students. Use the “Power of Presentation” technique to capture the students’ attention… and keep it. Reinforce the C.C.C.O.M. skills: Count, Compare, Classify, Observe, and Measure. Use the “Wow-Factor” approach to introduce concepts. Make the real-world connection using daily experiences as building blocks. You’ll receive a take-home “Survival Kit” filled with gizmos, gadgets and learning tools the moment you walk through the door. This is not your ordinary sit-and watch lecture. Be prepared to perform dozens of amazing science activities and take-home all of the necessary materials to get your students excited about science the very next day. Teachers may earn graduate level credit, also known as professional development units, through our partnership with Brandman University. These credits are not part of a degree program, but instead are primarily used for professional advancement (such as salary increment steps and recertification). You can earn up to two credits for attending the Hands-On Science Boot Camp workshop. An application for credit is given at the end of the workshop and must be completed within one month of the workshop. Payment is due with your application and is sent directly to Brandman University. More information will be provided at the workshop or upon request. If you don’t find answers to your specific question below, call Carly Reed at 855-228-8780 for immediate help. The cost of the workshop is $199 if paying by credit card and $249 if paying by check or purchase order. Please note that all registrations must be paid in full two weeks prior to attending the workshop. 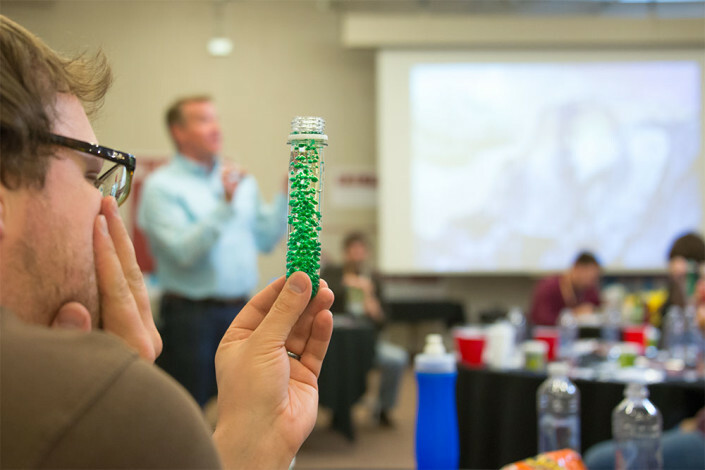 The price of the workshop includes a full day of hands-on science training as well as a “Survival Kit” full of take-home supplies and a comprehensive activity guide that you can use with your students immediately. We also provide a light continental breakfast and plenty of exciting surprises! CAN I USE A PURCHASE ORDER TO PAY FOR MY REGISTRATION? We do accept purchase orders to hold your space at the workshop. However, the purchase order must be paid in full at least two weeks prior to the workshop to guarantee your registration. We understand that you may need to cancel your reservation before the workshop. As long as you call our offices and cancel up to two weeks before the workshop, you will receive a full refund. Cancellations made after the two-week mark will be eligible for a 50% refund. I’M NOT A TEACHER BUT I WOULD STILL LIKE TO ATTEND THE WORKSHOP… CAN I COME? Our Hands-on Science Boot Camp is designed for teachers. If you are not a teacher, please contact Carly at (855) 228-8780 to determine if we have a workshop that would be a good ﬁt for you. YOUR WEBSITE SAYS THE WORKSHOP IS FOR PRE-K THROUGH ELEMENTARY TEACHERS… WOULD IT BE BENEFICIAL FOR HIGHER GRADES AS WELL? While Steve gears his workshops primarily for the younger grades, attendance and teacher feedback have shown us that teachers from every grade level will be able to take something away from the experience. Some of the lessons may require a bit of adaptation, but the overall methodology of getting students excited about learning is perfect for any age.